In anaerobic digestion process, temperature is not only important for microbial metabolic activities but also for the overall digestion rate, specifically the rates of hydrolysis and methane formation. 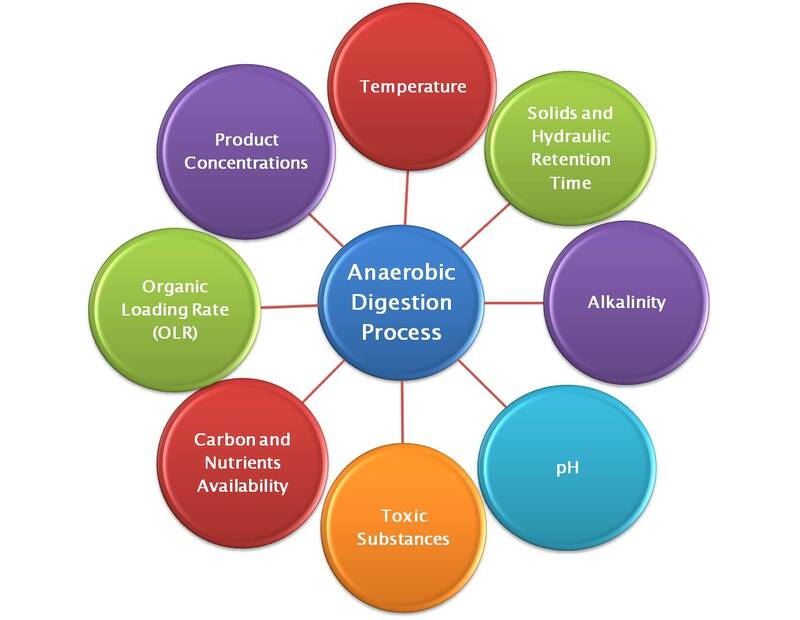 In general, anaerobic digestion process can occur within a wide range of temperatures. This temperature range has been divided into three groups: psychrophilic- less than 20 0C, mesophilic- 30 to 42 0C and thermophilic- 43 to 55 0C (Seadi et al, 2008). In practice, most of the anaerobic digestion system are designed to operate at mesophilic range, between 30 to 38 0C, and some of them are designed for thermophilic temperature range of 50 to 57 0C (Metcalf and Eddy, 2003). In general, thermophilic digestion processes potentially allow higher loadings with reduced hydraulic retention times, higher conversion efficiencies and pathogen disinfection while mesophilic digestion is more stable, less at risk from ammonia nitrogen toxicity and requires less process heat (Yirong et al., 2013). Solids and Hydraulic Retention Times (SRT and HRT) are the average time solids and liquids are held in the digestion process. Anaerobic reactions (hydrolysis, fermentation and methanogenesis) and anaerobic reactor size are directly related to these parameters. Each of the anaerobic digestion reactions requires a minimum SRT to be completed and if the design SRT is less, than that the digestion process will fail (Metcalf and Eddy, 2003). In a completely mixed reactor with no recycle, solids and hydraulic retention times are the same. In practice, for high rate digestion the values of SRT range between 10 to 20 days (Metcalf and Eddy, 2003). In general, hydroxides and carbonates of calcium, magnesium, sodium, potassium and ammonium produce alkalinity in the wastewater. Alkalinity plays an important role in anaerobic digestion process as it control the pH by buffering the acidity created in the acidogenesis process (Olvera and Lopez, 2012). The alkalinity of the digester in general is proportional to the solids feed concentration of the digester and in a well established digester the total alkalinity ranges between 2000 and 5000 mg/L (Metcalf and Eddy, 2003). The growth of anaerobic process microorganism significantly depends on the pH value of the system. Most methanogens prefer a narrow pH range and the optimal is reported to be 7 to 8. Acidogens usually have a lower value of optimum pH. The optimum pH interval for mesophilic digestion is between 6.5 and 8 and the process is severely inhibited if the pH value falls out of this range (Seadi et al, 2008). Presence of toxic inhibitory compound can adversely affect the anaerobic process microorganism. A wide variety of inorganic and organic toxic and inhibitory substances can cause anaerobic digester upset or failure. The commonly present toxic substance in anaerobic digesters include ammonia, sulfide, light metal ions, heavy metals etc. (Chen and Creamer, 2008). Oxygen and light; high amount of them could inhibit the activity of methane producing bacteria. Disinfectants such as herbicides, heavy metals or antibiotics found in poultry/chicken manure can also disturb the process if present in high concentration. Hydrogen sulphide (H2S) is a product of the digestion process but can be found in the organic material as well. Hydrogen sulphide and sulphuric acid are highly corrosive and could seriously affect the components of digester. A high ammonia concentration, which is a cellular poison, could be caused by high nitrogen and ammonium (NH4) concentrations under certain circumstances. In such case, substrates with a high Nnitrogen concentration like chicken manure/pig slurry should be diluted or mixed with another nitrogen-poor substrates. Nutrients like carbon, nitrogen, phosphorus and sulphur are very important for the survival and growth of anaerobic digestion process organism. Different micronutrients/microelements (trace elements) like iron, nickel, cobalt, selenium, molybdenum or tungsten are also essential for the anaerobic process microorganisms. Insufficient amount of these nutrients and trace elements can cause inhibition and instability in anaerobic digestion process. The ideal carbon to nitrogen (C: N) ratio for anaerobic digestion ranges from approximately 20:1 to 30:1 (EPA, 2012). The optimal nutrient ratio for the carbon, nitrogen, phosphor, and sulphur (C: N: P: S) is considered to be 600:15:5:1 (Seadi et al, 2008). It is also reported that to maintain optimum methanogenic activity, desirable liquid phase concentration of nitrogen, phosphorus and sulphur should be in the order of 50, 10 and 5 mg/l (Metcalf and Eddy, 2003). In addition, it is suggested that level for iron, cobalt, nickel and zinc should be 0.02, 0.004, 0.003 and 0.02 mg/g acetate produced respectively (Metcalf and Eddy, 2003). Organic Loading Rate (OLR) is defined as the amount of organic dry matter that can be fed into the digester per unit volume of its capacity per day. It is usually calculated based on the mass of volatile solids added per day per unit volume of digester capacity. Another way of calculating it is, the amount of volatile solids added to the digester each day per mass of volatile solids in the digester; although the first approach is favorable (Metcalf and Eddy, 2003). Loading rate is an important operational factor for digester because if it is too high, valuable methane former can washout from the system. In addition, toxic materials like ammonia can accumulate and upset the process. On the other hand, if the lading rate is too low, it can result in lower organic solids destruction and lower biogas production. Moreover, larger uneconomical digester will require higher heats. For these reason, the optimum loading rate should be a compromise between the highest possible biogas generation and having a justifiable plant economy (Seadi et al, 2008). The stability of the anaerobic digestion process also depends on concentration of some products produced during the organic break-down process, like Volatile Fatty Acid (VFA). During the acidogenesis process, different fatty acids like acetate, propionate, butyrate, lactate etc. are produced. Excessive accumulation of these acids can drop the pH value inside the reactor when the buffering capacity of the digester is exhausted. The buffering capacity of the digesters and how they will react to certain amount of VFA concentration vary from digester to digester based on its microbial population (Seadi et al, 2008). EPA (2012); Increasing Anaerobic Digester Performance with Codigestion, www.epa.gov/agstar. Metcalf and Eddy (2003); Wastewater Engineering: Treatment and Reuse, 4th ed., McGraw-Hill, New York. Olvera, J. R. and Lopez A. L. (2012); Biogas Production from Anaerobic Treatment of Agro-Industrial Wastewater, Biogas, Dr. Sunil Kumar (Ed. ), ISBN: 978-953-51-0204-5. Seadi, T. A., Rutz, D., Prassl, H., Köttner, M., Finsterwalder, T., Volk, S., Janssen, R. (2008); Biogas Handbook. Yirong, C., Banks, C. J. and Heaven, S. (2013); Comparison of Mesophilic and Thermophilic Anaerobic Digestion of Food Waste, www.redbiogas.cl/wordpress/wp-content/uploads/2013/07/IWA-12154.pdf.